BG214 dual 3 x 132 inch heavy duty backstand grinder features dual 3” x 132” belt grinding heads for fast metal removal! 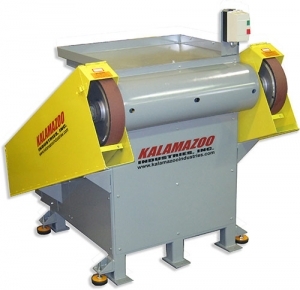 This machine was designed to meet a customer certain application and is now a standard belt grinders. This dual belt grinding unit allows the operator to run multiple belt grits at once on one grinder unit. 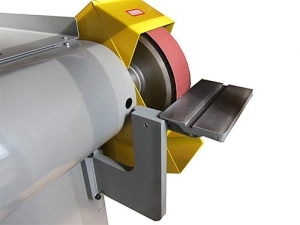 The dual belt grinding heads of the BG214 nearly eliminates grinder down time, increases operator productivity and increases product output. The BG214 dual 3 x 132 inch heavy duty backstand grinder other features are easy access design that allows the operator to access the 14” x 3” contact wheel with full left to right movement so they can snag, roughing, contouring, angles and shaping 10HP 3PH 220V or 440V motor, isolation pads, replaceable v-belts. BG214 dual 3 x 132 inch heavy duty backstand grinder is great for steel foundries, aggressive grinding, descaling, deburring, and finishing. 10Hp 3Ph 220 or 440v (please specify). Dual 14″ x 3″ 70″ duro serrated contact wheel. Optional: parts table. It has to be ordered and built with machine. Can’t be add in the field. Amp draws: 208V 26.5 amps, 220V 24 amps and 440V 12.5 amps. Easy to replace parts and change belts. Options: variable speed drive, work table (see picture below) and other size backstand grinding units available. Work table is optional and has be order when machine is order. Can’t be added after it’s in the field. BG214 dual 3″ x 132″ parts list. Kalamazoo Industries BG214 3″ x 132″ cut sheet. Kalamazoo Industries resource center. check it out.